(CNN) -- How many people in New Orleans will have to make major repairs to or completely rebuild their homes? President Bush told the nation there is a "powerful American determination to clear the ruins and build better than before." 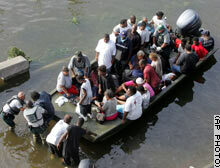 New Orleans Mayor Ray Nagin has what federal officials say is an ambitious plan to bring 180,000 people back to the city. The mayor has said, "I just can't wait for the rhythm of New Orleans and the sounds of New Orleans to come back." 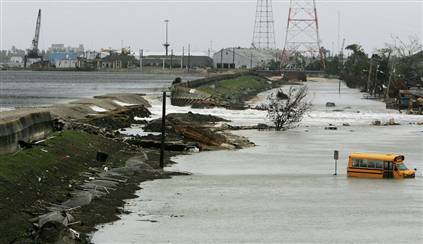 NEW ORLEANS - Hurricane Rita’s steady rains sent water pouring over a patched levee Friday, cascading into one of the city’s lowest-lying neighborhoods in a devastating repeat of New Orleans’ flooding nightmare. “Our worst fears came true,” said Maj. Barry Guidry of the Georgia National Guard. Dozens of blocks in the Ninth Ward were under water as a waterfall at least 30 feet wide poured over and through a dike that had been used to patch breaks in the Industrial Canal levee. On the street that runs parallel to the canal, the water ran waist-deep and was rising fast. Guidry said water was rising about three inches a minute. Water also poured out from under the canal's western barrier, which faces the historic French Quarter roughly three miles away. An official with the New Orleans Fire Department said flooding reached a mile inland west of the canal. It also reached as far north as Interstate 10, which divides the city. The impoverished Ninth Ward was one of the areas of the city hit hardest by Katrina’s floodwaters and finally had been pumped dry before Hurricane Rita struck. Throughout Friday morning, water began rising again onto buckled homes, piles of rubble and mud-caked cars that Katrina had covered with up to 20 feet of water. Monday was devastating. We were out doing live reports all day. I've been in a lot of hurricanes, but this lasted longer and was more powerful than any I had seen before. At one point, the van we were in was demolished by a 200 pound chunk of fence. We could only imagine what happened to people who decided to ride this storm out instead of leaving. When we drive now for miles and miles, it is hard to believe the level of devastation. Now is an especially tough time, here in Mississippi, because the state is still out of electricity and water. And no one is talking about when it will be back. It is hot. In most neighborhoods, people haven't seen anyone of any authority. People are angry. They are wandering, in many cases aimlessly. That's what strikes me about this hurricane. (CNN) -- Rescuers and residents along the Gulf Coast struggled Wednesday to cope with the destruction left by Hurricane Katrina, as New Orleans faced a horrifying trio of challenges -- rising water, stranded people and a refugee situation that is getting worse by the hour. The death toll from the storm is estimated to be at least 120 but officials expect it to be much higher. In Mississippi alone, the death toll was as high as 110, and emergency official told CNN. Louisiana Gov. Kathleen Blanco told CNN Wednesday morning that officials were facing enormous challenges as they tried to stabilize the situation in New Orleans, where floodwaters continued to rise. NEW ORLEANS - Desperate for fresh air, dozens of refugees from Hurricane Katrina slept on the walkway surrounding the Louisiana Superdome as conditions inside worsened and even more people were brought to the huge arena Tuesday. The bathrooms were filthy and barrels overflowed with trash. With the air conditioning off since power went out Monday morning, the bricks were slick with condensation. Despite the conditions, the Superdome was a welcome refuge for people rescued from the rising water in the city Tuesday. National Guard troops brought refugees in their big 2 1/2-ton trucks, and Louisiana's wildlife enforcement department brought more people by pickup. "I almost died in the night water," Willie Anderson, 49, said as he arrived at the Superdome. He had spent the night in his attic in the inundated Ninth Ward. A groan rose from a group listing to a newscast when the devastation was detailed and officials in suburban Jefferson Parish said residents wouldn't be allowed to return until Monday. One woman cried. "We're doing everything we can to keep these people comfortable," Gen. Ralph Lupin, commander of the National Guard troops at the Superdome, said Tuesday morning. "We're doing our best. It's not getting any better but we're trying not to let it get any worse." "I know people want to leave, but they can't leave," he said. "There's 3 feet of water around the Superdome." Officials were considering moving the patients to areas with better accommodations. "This is just too hot, too primitive, too uncomfortable for the patients and too hard to work in for the medical people," said Dr. Kevin Stephens Sr., head of the medical shelter in the Superdome. Two people had died, according to Doug Thornton, a regional vice president for the company that manages the 77,000-seat Superdome, of the NFL's New Orleans Saints. He provided no details. Katrina ripped two holes in the curved roof, but Superdome and government emergency officials stressed that they did not expect the huge roof to fail. "I was OK until that roof fell off," said 82-year-old Anice Sexton. "I was terrified then. Otherwise it hasn't been too bad. People are so nice and the people staying here have really been cooperative. But the washrooms are terrible."